“Armenia has been in our bones since early childhood, so I was mentally ready to embark on this journey,” exclaimed the Syrian native, who moved to Yerevan from Aleppo last year and who first visited Armenia on his honeymoon back in 2014. In 2016, when his wife Nanor, 28, was first pregnant, Avo, 32, sent her to Yerevan to flee the war. He then traveled back and forth between Aleppo and Yerevan for a time until their baby, Soseh, was born. Previously, Avo had worked for his father’s printing business, so while in Yerevan he constantly tried to conduct market research on what could be a profitable business idea to start in Armenia. When he finally left Syria for good, he started producing hummus under the trade mark Kanach Snund. There is still much work to be done before Kanach Snund becomes more profitable, however. But Avo is driven and hopeful. “You can squeeze money out of everything and everywhere; you can find jobs if you see the market potential and seize the opportunity at the right time. It’s much easier in Aleppo—in terms of market and population size—than in Yerevan,” he said. Currently, Avo and his wife produce 50 kg of hummus a day, which they distribute to about 120 stores and supermarkets in Yerevan. 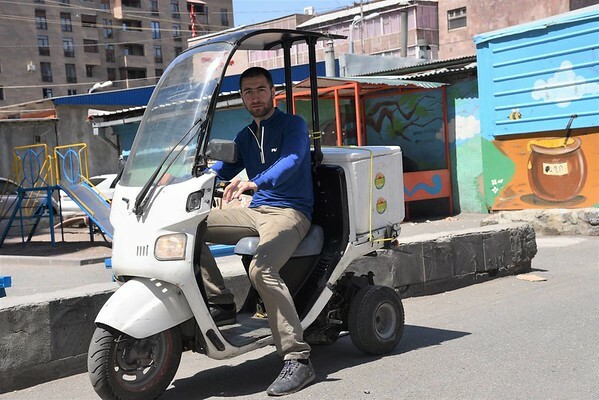 For the past couple of months, Avo has been delivering the orders via his moped that he was able to purchase with the help of FAR’s Small Business Assistance Program (SBA). “It’s a big issue to drive in the city center by car during the day, with no place to park, traffic jams, etc. In this sense, a moped is very comfortable and fast enough to deliver the packages to our customers,” Avo explained. FAR’s primary focus through SBA is to support those Syrian-Armenians who recently launched their own business and who have invested all of their efforts and resources into implementation. “Along with them, we also embrace challenges that result in breaking ground for our success,” said FAR’s Economic Development Projects Manager Eric Baghdasaryan.